THE STORY - As rioting rocks Los Angeles in the year 2028, disgruntled thieves make their way to Hotel Artemis -- a 13-story, members-only hospital for criminals. It's operated by the Nurse, a no-nonsense, high-tech healer who already has her hands full with a French assassin, an arms dealer and an injured cop. As the violence of the night continues, the Nurse must decide whether to break her own rules and confront what she's worked so hard to avoid. THE GOOD - A great ensemble. Jodie Foster’s performance. Competently crafted world. Occasional moments of levity and entertainment​. ​There’s nothing quite like a good B-movie to be one of the most thoroughly entertaining trips you’ll have while watching a film. Not every good movie has to be a serious drama that is providing an artful addition to the rich tapestry of cinema. There is a place for fun, harmless entertainment, and often times these sections offer a great deal of enjoyment. However, there still needs to be a calculated process in order to achieve this perfect balance, and some films are able to acquire this better than others. Sadly, this is one such occasion where the whole is far less than the sum of its parts. It is ten years into the future, and like most films that take place in a time ahead of our own, the world is not in the best of spirits. A shortage in the water supply is driving a series of deadly riots throughout LA, and it serves as the backdrop to the main story. The leader of a gang of criminals (Sterling K. Brown) finds his crew critically wounded after a heist goes wrong. 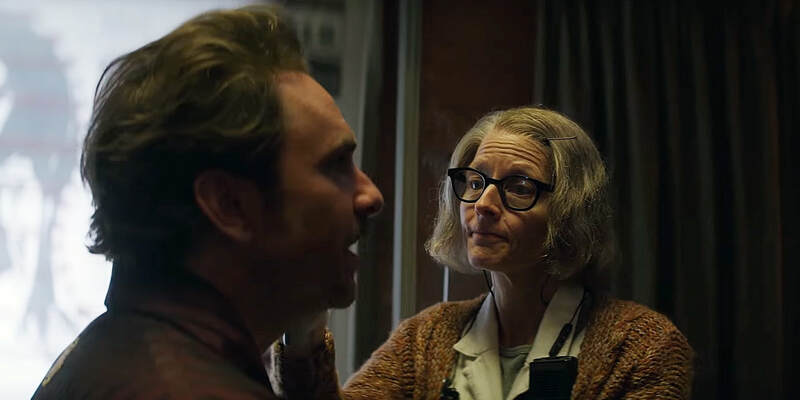 His plan is to go to the "Hotel Artemis," an underground hospital that caters exclusively to criminals and is very stringent on rules. It is run by a nurse, played by Jodie Foster, who runs the hospital as efficiently as possible. It is on this particular night when the patients start to clash and bigger conflicts are in store. With this being the feature directorial debut of Drew Pearce, there is most certainly some promise shown here behind the camera. It’s a competently put together movie that sometimes takes a while to find its rhythm, but once it does manage to create a lived-in feel for this off-kilter world, helped nicely by the cinematography by Chung-hoon Chung. At the same time, there is a timid nature to the style that I wish had been pushed further into a more pulpy arena. Its R rating is earned but could have been driven further to the limit to sell this mood. The fight scenes aren’t particularly well choreographed, the deaths are relatively uninspired and there’s an overall lack of flashiness that was badly needed to distract from the underwhelming plot. In truth, it is the screenplay that is the weakest aspect of the film. It hobbles together a collection of moments that are often entertaining without ever finding a way to make it all tie together. The plot mashes together many threads that intersect to this one location without every convincingly connecting them in a satisfying way. None of this is helped by the dumb characters that parade around this film either. Honestly, the story is pretty inconsequential, which would be a forgivable sin had the rest of the movie acknowledged that and put all of its resources into a robust and fun action thriller (á la The Raid). Instead, we get predictable character arcs that are shackled by an underdeveloped narrative. One of the most impressive elements of this film is undoubtedly its cast. In addition to Brown and Foster, there’s Dave Bautista as an intimidating orderly, Sofia Boutella as a cunning assassin, Charlie Day as a brash American businessman, Jenny Slate as a wounded cop brought into the fold, Jeff Goldblum as the city’s notorious crime boss, and Zachary Quinto as his overcompensating son. All very talented players, but what often happens in films with this many exceptional actors is that none are given the equal screen time they truly deserve. Most feel like glorified cameos, and just as you feel an interesting development being presented, they either exit the film rather unceremoniously or crawl back to their shallow nature. I would not fault these actors at all; I know they are all capable of delivering strong work. It is, unfortunately, the script that lets them down. Still, I did find a good bit of enjoyment out of Foster and Brown in particular. They clearly have the most developed characters, and while their journeys are not the least bit unsurprising, they manage to mine as much depth as they can. Foster, in particular, feels like the only finding the right balance between genuine pathos and good-natured humor. There are moments of enjoyment with the rest of the cast, but again, these are few and far between in an ensemble that never truly gets enough of the spotlight to really shine through.